Students at SUNY Albany Demand a Safer Campus for Survivors! The university has a responsibility to support the students and create a safe environment. They are failing and reducing supports for survivors instead of increasing them and that needs to change. Students are mobilizing to demand resources, access to information, and more power in the decision making process relating to hiring and firing, as well as the process for supporting survivors. It has come to our attention that the contract of Christin Guilder, Assistant Director of the Advocacy Center for Sexual Violence, is not being renewed at the end of this semester. This information has not yet been openly disclosed to the public, nor has an adequate explanation as to her termination been provided. We, concerned students, alumni, faculty, staff, and allies, demand answers; specifically, the following. Firstly, we demand more transparency in the hiring, firing, and employment status of university staff. While we understand that this may be difficult to provide for every university employee, staff whose primary responsibilities include fostering connections with students for emotional and mental support are thereby depended on by members of the campus community and expected to offer a sense of stability. While one may leave his or her position in such a role for any number of reasons, students should be alerted to these changes in employment status in order to make appropriate changes to their self-care regimen. Secondly, we demand an open forum in which these decisions can be discussed openly with students. As students contribute to both the financial and emotional health of the university, it is necessary that we are alerted to any changes in the budget or cultural climate that apparently require the termination of an employee as valued as Guilder. Thirdly, we demand more resources be made available in which students can openly discuss both sexual assault and their concerns with the university’s current advocacy initiatives. The termination of Guilder’s position leaves students with only Carol Stenger in the Advocacy Center, despite the many testimonies from students and alum citing her incompetence and unsafe practices. Students must be provided more on-campus alternatives to the guidance of Stenger, as well as information of off-campus resources such as the Crime Victim & Sexual Violence Center. Simply making this information available on a website is not enough; these resources should be publicized to the same extent as our on-campus Advocacy Center, even if it doesn’t reel in the same profits or veneer of public image. As your office has continuously stressed “community engagement,” we ask that you live up to these standards you purport to achieve. Lastly, we demand the immediate renewal of Guilder’s contract, including a statement from the university president acknowledging our concerns and the need for expansion of resources in the fight against sexual assault in our campus community. 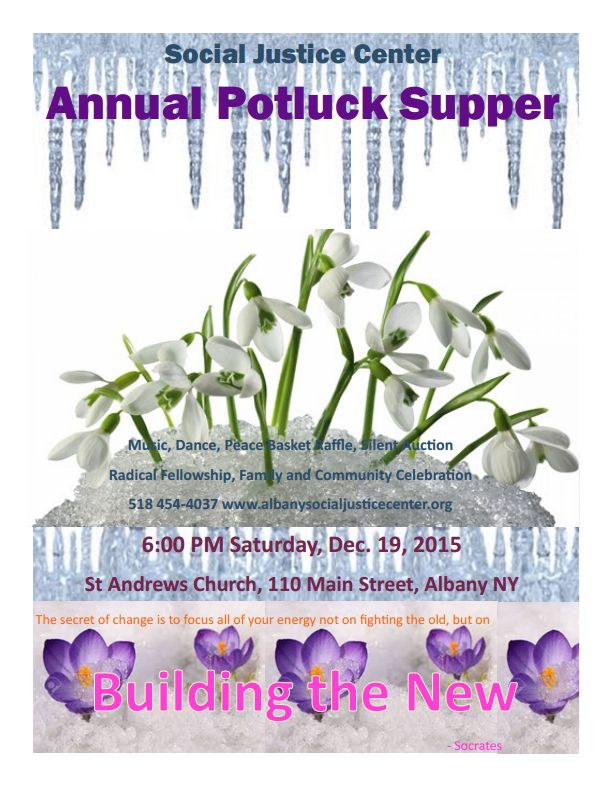 Annual Potluck Supper Dec. 19! Celebrate our successes with family and friends for a good dose of radical fellowship and hope! Help Us Fix Our Sidewalk Hatch! The 2015 Capital Region AIDSWalk is on Saturday, 9/26 in Washington Park in Albany. Registration begins at 11 AM and the walk begins at 12 PM. To register for the walk visit the Whitney Young Health website by clicking here. If you want to purchase a t-shirt go to bonfirefunds.com! This walk is a wonderful way to celebrate the lives of friends, family and our neighbors living with HIV/AIDS! Hope to see you there. Come find the Social Justice Center's table at the University at Albany's Community Service Fair on Wednesday March 11th. Interns and volunteers wanted! New Director And Associate Director! The Board of the Social Justice Center of Albany is happy to announce we have named Angelica Clarke as our new Executive Director. Angelica has a lifelong history of working toward social justice and grassroots anti-oppression organizing. In the Capital District she has focused on preserving public higher education; organizing with Save Our SUNY, co-founding New York Students Rising, and most recently working as a labor organizer for Graduate Student Employees Union. She has a background in anti-war organizing, alternative community childcare and organizing for queer liberation and has served on the SJC Board since 2013. Angelica starts transitioning to the leadership position immediately, getting to know the many circles of SJC programs and people and working with departing director to learn the “incredibly random but important stuff Victorio (Reyes) has compiled in his brain over 11 years.” Fellow board member Laura Travison is stepping up to serve as Associate Director with Angelica through the transition period, tentatively through May. Victorio will continue to participate as a member of the Board. As a committed revolutionary, Angelica brings her dedication to a justice that takes into account race, gender, ability and class disparities in leading the Social Justice Center into the next decade. Come and welcome her, share your stories, and help to shape the future of the SJC! The Center remains open Monday, Wednesday, Thursday and Friday from 11am-2pm. Check our Facebook page, our webpage or call 518 434-4037 for more information. Thank YOU! Our Annual Winter Potluck was a success. The Board of the Social Justice Center of Albany announces that Executive Director Victorio Reyes will step down from his position in February 2015. Reyes started 10 years ago, taking the Center from organizing with flyers on phone poles to providing public space, stability, visibility, and fiscal sponsorship to organizations working for social justice in Albany and across the state. He uses his art as a tool for justice and energetically engages multi-generational progressive activists. He will remain committed to the Center as an active Board member, while pursuing his dream of expanding his career as teacher and writer. The Social Justice Center board views this as a time for renewal and change. 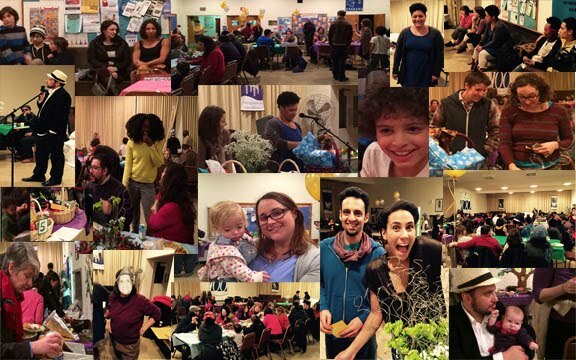 We invite activists young and old to join us in revisioning the Center’s purpose and developing ways to use the Center’s space to meet the current and future social justice needs of the Capital Region. We invite letters of interest if you would like to be considered for membership on the governing board. The Social Justice Center Annual Winter Potluck Dinner is scheduled for December 13th, 6:00 P.M., at the Parish Hall of St. Andrew’s Episcopal Church, 10 North Main Avenue (corner of Madison and Main). This year’s dinner will be a celebration and appreciation of Victorio Reyes for his ten years of service to the Social Justice Center and the activist communities of the Capital Region. In addition to the potluck dinner, there will be a dance party and Social Justice Baskets for raffle, put together by SJC members and friends. Invite family and friends to join us to honor Victorio and the work we have all accomplished together over the past ten years. Get more details and bid on a Basket on line when the bidding opens in November. For more information contact the SJC at 518 434-4037, or info@albanysocialjusticecenter.org.